Salisbury – Mayor Jake Day is pleased to announce that the Riverwalk Amphitheater has been renamed in honor of the Pohanka of Salisbury Automotive Group. The newly-christened Pohanka Riverwalk Amphitheater takes its name from the company which has donated $75,000 to complete the second phase of construction on the performance venue, as well as another $25,000 to establish the City’s newest holiday tradition – the Salisbury Ice Rink. The City celebrated a new holiday tradition last year, welcoming an ice skating rink to the City Park as part of the Winter Wonderland display. Generously provided by Pohanka of Salisbury as part of their Pohanka Pays It Forward program, the ice rink offered a unique and enjoyable holiday experience for hundreds of Salisbury families. “We saw how much joy it brought to all of the families who came out to experience the ice rink. Ice-skating in December is just one of those time-honored traditions, and that’s why we thought it should be an annual one,” explained Sandy Fitzgerald-Angello, Vice President and Dealer Operator of Pohanka of Salisbury. 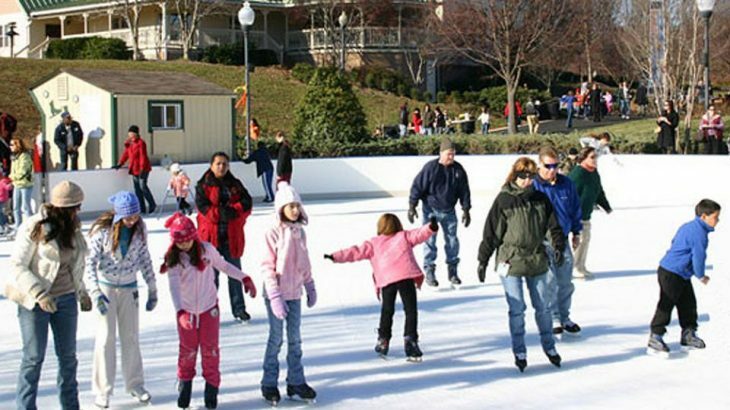 Determined to keep the holiday spirit alive, the Pay It Forward program generously purchased and donated a 1,800 square foot ice rink to the City of Salisbury. Now located at the Riverwalk Amphitheater, the glossy ice rink will be open to the public every weekend in December until Christmas. “Not only is this donation from Pohanka a great recreational addition to the city’s downtown, but it’s also going to be a tremendous resource for local non-profits as well,” said Mike Dunn, President, and CEO of the Greater Salisbury Committee. Working with the City of Salisbury, the GSC and Pohanka are looking to partner with several non-profits who will oversee the operation of the ice rink each weekend. Net proceeds collected from skate rentals will go towards benefiting the participating non-profits. This generous donation by Pohanka comes as the latest in a decade worth of charitable giving under the “Pays It Forward” program. Continuing to make a name for themselves throughout the community as more than just a leader in automotive sales and service, Pohanka’s charitable giving program has effected change in every corner of the Eastern Shore. Pohanka’s commitment to support local non-profit organizations has resulted in the donation of more than $2.5 million to nearly 1,000 different charities. “Pohanka prides itself on being able to help the community as much as possible. We believe it’s important to support anyone looking to make a difference and make the Eastern Shore a better place to live,” emphasized Conrad Morgan, Pohanka’s Marketing Director. In addition to the generous donation of the ice rink, Pohanka has committed an additional $75,000 to help complete the Riverwalk Amphitheater’s second phase. 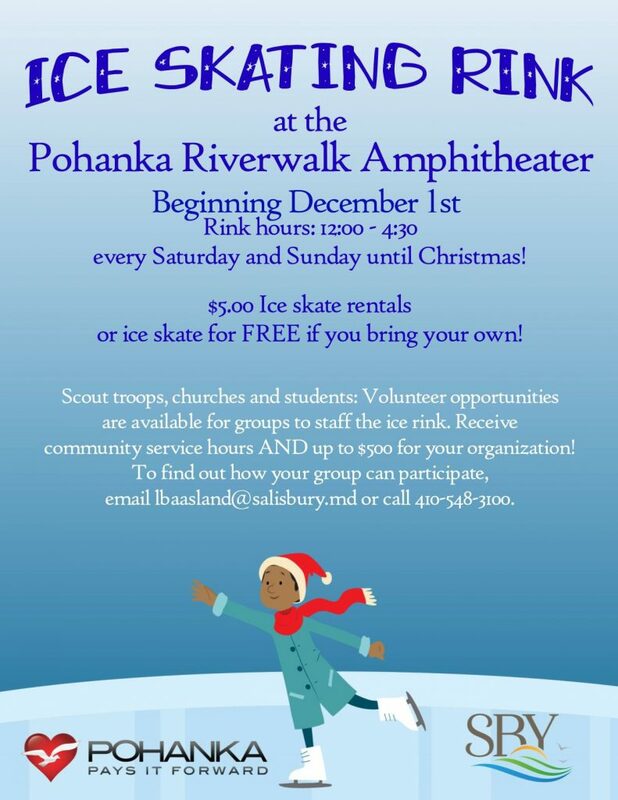 The Mayor and Pohanka encourage citizens to join them on Saturday, December 1st at noon to celebrate the opening of the ice rink, and to officially cut the ribbon on the new Pohanka Riverwalk Amphitheater. For more information, contact the Mayor’s Office at 833-SBY-City.